Starting this spring, the City of Seattle construction on the Mercer West Corridor project will restrict traffic flow on Mercer Street to two eastbound lanes west of Aurora Avenue N. To keep Route 16 moving during construction, Metro will shift the route from 5th Avenue N to Aurora Avenue N. This reroute will affect where you get on and off the bus, so please watch your stops for closure information. The first stop to close will be northbound on Aurora Avenue North just south of Mercer Street on April 22, 2013. The other stops along 5th Avenue N and Cedar Street will close May 18 May 20 (updated) and will remain closed through the summer of 2015. The map shows where the new stops will be located relative to the old stops. If the stops are too far apart for you, please note that routes 3 and 4 will still be operating on 5th Avenue North. To get to destinations along 5th Avenue North, ask the bus driver for assistance or use Metro’s Trip Planner (http://metro.kingcounty.gov), or call Metro Customer Information, 206-553-3000. @Al Those stops will be closed to all routes by construction. I suspect buses will end up serving the stops adjacent Denny instead. 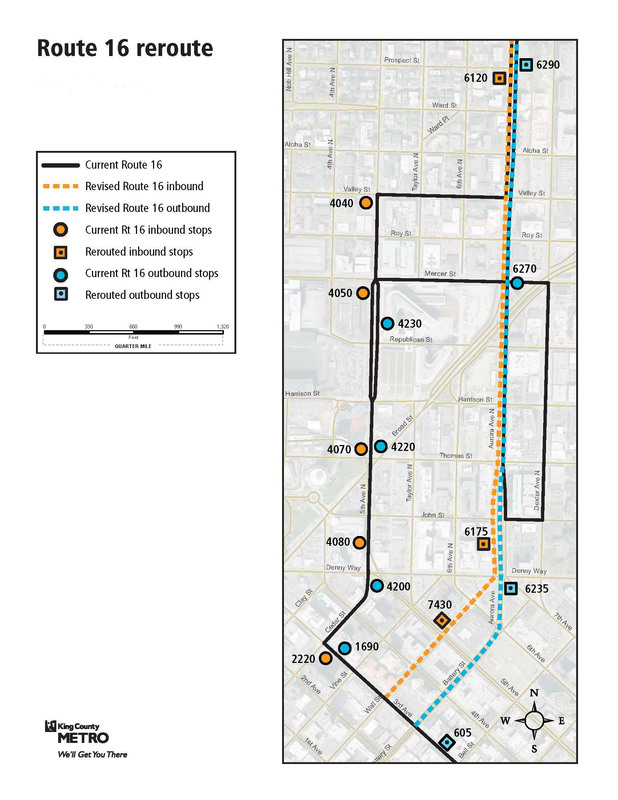 Is the rerouted 16 going to skip Broad (southbound) and Mercer (northbound) during the reroute? They’re pretty popular stops on the routes that serve them, and even the express routes that skip some Aurora stops serve them. More generally, I really hope the improved ability to cross Aurora after all the construction in this area is done allows the 16 to stay on Aurora in the long term, providing faster service to downtown and access to both sides of Aurora. I know there are two sides to this sort of thing; that’s the one I’m on. The Guideline reports with productivity reports for each route should be announce as they are produced and shared by Metro. Some means of showing comparison of all services such as Sound Transit in the Metro area should be developed and shared.